This is the first in a series introducing the key inter-party battle fields in the upcoming April 11 general elections. ― Ed. Jongno is one of the oldest districts in Seoul and also a complex area which embraces the affluent neighborhoods around Cheong Wa Dae and the low-income ones around Dongdaemun. The constituency is thus recognized as a general election bellwether and it is where two leading party big shots will test their luck next month in the next parliamentary term and that of their respective parties ahead of the presidential race at the end of the year. The main opposition Democratic United Party has fielded former Democratic Party chairman and fourth-term lawmaker Rep. Chung Sye-kyun. In response, veteran lawmaker Rep. Hong Sa-duk is running against Chung for the ruling Saenuri Party. Chung, also regarded as one of the left-wing’s leading presidential potentials, left his longtime constituency in the southeastern province of North Jeolla with a pledge to win Jongno back from the ruling party. The opposition lawmaker has largely focused on canvassing the folksy areas, such as Changsin-dong and Sungin-dong, and met with residents who requested the annulment of the city’s redevelopment project in the area and the promotion of the local textile factories. “The Jongno people are disappointed with the poor achievements of the right-wing party candidate in recent years,” Chung said. For the past three terms, ruling party member Rep. Park Jin has been elected to represent the constituency. “I have been promoting the opposition camp’s image since late last year and am more closely connected with the local community,” Chung said. Six-term lawmaker Hong, tapped by the ruling Saenuri Party for the crucial race, is a formidable rival for Chung. A leading supporter of ruling party emergency council chair Park Geun-hye, Hong started by acquainting himself with the local organizations, including religious centers such as the Buddhist temple Jogyesa. He has also spent a great deal of time campaigning on the streets in Samcheong-dong and Myeongnyun-dong, the relatively affluent areas in Jongno-gu. The candidate, while greeting citizens, displayed the slogan “honest sixth-term” to emphasize that he has never been involved in irregularity scandals over his long political career. The Saenuri runner was mostly accompanied by fellow lawmaker Park Jin, who earlier gave up his candidacy in the area and took the post as Hong’s election campaign manager. “Rep. Hong also has top potential to be the next parliamentary speaker, should he be reelected,” said Park. He also stressed that the constituency has always been in favor of conservative politicians, except for the victory of liberal former President Roh Moo-hyun in the 1988 by-election. 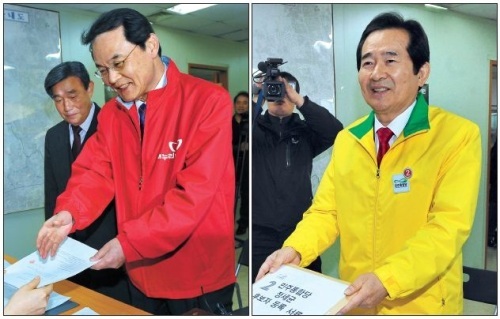 Both Chung and Hong registered their candidacy with the National Election Commission on Thursday. The official electoral campaign period is to kick off next Thursday until midnight, April 10.